Reports of our investigations have been published in: Turiang: a Fourteenth Century Shipwreck in Southeast Asian Waters (2001) a monograph published by the Pacific Asia Museum, Pasadena, California. Another museum catalogue: Maritime Archaeology and Shipwrecks Ceramics in Malaysia (2002) is published by the National Museum Kuala Lumpur, Malaysia. Both books are written by Roxanna M. Brown and Sten Sjostrand. To order the catalogue. The latest book: "The Wanli Shipwreck and its Ceramic Cargo" (about our 17th century shipwreck) can be viewed on this site. A number of other reports and articles have been written which have made a great contribution towards the better understanding of the development of Chinese and Southeast Asian ceramics and early maritime trade in this region. These reports are published on the Internet at: http://www.maritimeasia.ws. The company works closely with the Malaysian Government and the Museums Department and bears all costs associated with the search, investigation, recovery and research of these shipwrecks. The recovered artifacts are shared between the government of Malaysia and Nanhai Marine Archaeology. We sell some of our pieces on the Internet, through Nanhai Marine Archaeology LLC in Delaware, in order to fund new projects. Nanhai Marine Archaeology is based in Malaysia and specializes in the search for historical shipwrecks and the history and development of Chinese and Southeast Asian ceramics. This involves underwater excavation and extensive research into the ships' design, construction as well as its antique porcelain and pottery cargoes. We are an independent and self-financing company with a uniform approach to exploration which means wide areas of the seabed can be explored and undisturbed sites discovered. We engage experienced divers and extend an open invitation to all scholars and other experts to help maximize the knowledge gained from these sites and contribute to the quality of the research results. Most of the shipwrecks we've discovered are located in the South China Sea, far from shore and in deep water. 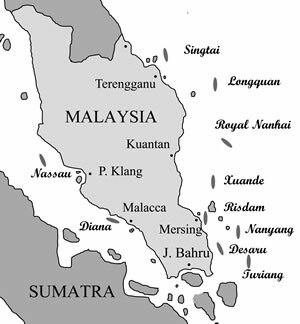 Note: all ships, whether they were going to the Middle East, India , Malacca or not, had to go around the coast of Malaysia to go through the Straits of Malacca. The artifacts sold on this website are therefore legally and properly excavated and can be supplied with an export permit from the Department of Museum in Malaysia should this be required. This unique working arrangement makes us one of the few Internet sellers that sell from own excavation and deliver a meaningful Certificate of Authenticity for all artifacts issued with a serial number. When buying anything from our web pages you are NOT dealing with antique dealers or other middle men. You will be buying directly from a team of dedicated researchers that excavated, recovered and researched every single piece offered for sale. We encourage you to contact us by email with questions regarding your possible purchase. Write to: Sten Sjostrand. If you are not satisfied with our artifacts, delivery service or; if you obtain an expert opinion that our artifacts are not as old as stated by us, just return the item and we will give you full refund. All our artifacts and publications will be shipped from our store in Malaysia. The default shipping metod is "Registered Air Parcel" which is managed by Malaysia’s national post office. Once your package is delivered to the post office, you can track its routing INSIDE Malaysia by clicking here. If you reside in the US, you can track the package's routing WHEN in the USA by clicking here. All other customers can find their national post office and their respective online tracking systems by clicking here. When at these tracking sites, you should enter the 13 digit tracking number -which we will provide you in a separate email after sending your order. Once this is done, we would expect to be notified about the safe arrival of the artifact(s). Should we not receive such arrival notice inside three weeks from the date when the items were delivered to the Malaysian post office, we will consider it delivered and close the account without any possibility to trace its loss or delivery thereafter. We do not insure our shipments due to costly premiums and difficulties with claiming compensation in case of damage or loss. Instead, we provide safe packing boxes where each artifact is embedded and separated by foam padding. Should you despite this care receive your piece(s) damaged, we ask you to return it to us after sending us pictures of its condition on arrival. We shall then send you replacement piece(s) -free of charge. If the tracking system confirms that your package has been lost, we shall replace the artifact(s) without cost to you. To read our customer's comments on shipping & packing, please visit our testimonies page. Here you can email the buyer directly for verification of their statements. Please note that each of these customers has agreed to us publishing their email addresses such that anyone can write to them for confirmation of their various comments.